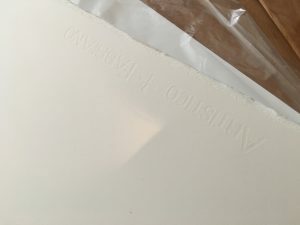 My very favoritest paper to work on is Fabriano’s Artistico, a paper from a company so old that Michelangelo bought from them. I cannot describe how lovely this paper is. It is not the perfect paper for every artist, but it is the perfect paper for me, and I have been using it exclusively since I discovered it. And then Fabriano decided to “improve” it. And the reformulation is awful. This paper was so much a part of my joy in painting that for several years I simply quit. I dabbled in acrylics and oils in an attempt to find some new way of working, but none of those attempts clicked. And I didn’t think about it again… until I found my paper in the discontinued rack of a local art store. …since then, I’ve checked the discontinued paper section of every art store I’ve visited, and I’ve scored several more finds. There have been days I’ve left with $300 worth of paper and no regrets! But I’ve run out of places within my reach, which means it’s time to put out an offer to the world at large. If you find this particular paper while you’re browsing and are willing to buy it for me, I will pay for it and shipping and bribe you in some other way. Food, books, art, money… tell me your price! But it’s got to be the right paper. Which means you won’t find it in the regular aisle. Fabriano still sells Artistico, remember, but they’ve changed it. 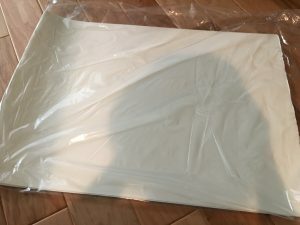 The stuff you want is sold by the sheet (see below), not in a block, and it’s discontinued. It should have a watermark (see top photo). It comes in both 300 lb and 140 lb and I’ll take either. (I’ve photographed the 300 lb below so you can see how thick it is). I only want hot press. The surface should be smooth as a plate! 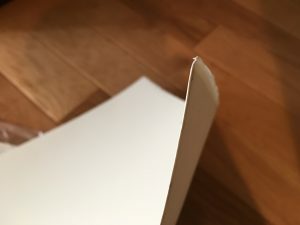 If you happen to run into this stuff and are leery of shipping it, I don’t mind you having the art store cut it in half, which should make it a manageable size to mail. And yes, if you are international, I’m still interested… but you will have to cut it down, because oversize packages from overseas are gut-wound-expensive. But I will happily take a bunch of smaller sheets of this stuff if it means I can have it!